You’ll remember earlier this week I made a recipe with a half a pound of minced beef? As the weather turned from crisp and clear to rain, rain and well a little more rain, I was in need of something nourishing to go with the batch of focaccia I’d made. I decided to batchcook so added some extra protein to the pot so that I could freeze half of the warming chickpea stew for another day. As with most of my recipes, you won’t find gourmet plating! What you will find is happy, smiley faces eating this dish. The kids loved scooping up the stew with spoons and mopping the juices with the bread. I love the flavours, and the fact that it’s low on fat, high in fibre and easy on my pocket. As a bonus, most of my ingredients came from the store cupboard the meal was put together without having to go to the supermarket in the lashings of rain to get fresh vegetables. The cost comes to €5 for the entire stew which also allows for the cost of electricity for your hob. Add in the cost for making the bread twice (€2.40) and the portion cost is just under 93c per person, for 8 portions. Take a large heavy bottomed saucepan or deep frying pan and heat on high until smoking. Fry off the minced beef with no oil (if you’re using chicken or turkey mince use a small amount of sunflower oil). Make sure you use the same method as earlier in the week, and get the chunks of minced beef golden brown and crispy. When all the meat has coloured, add the dried spices and coat the meat in the frying pan. Stir well for 3 minutes so that the aromas are released into the air. Pour in the tin of tomatoes and the chickpeas, finally add the sweetcorn. Turn down the heat and bring the mixture to a slow simmer. Cover pan firmly and cook for 30 minutes before serving. I used bread, but steamed rice or boiled potatoes works just as well. Remember I’ve not added salt to this dish, so you may like to season your meal before eating. I love hearing stuff like that! I hope he enjoys it. 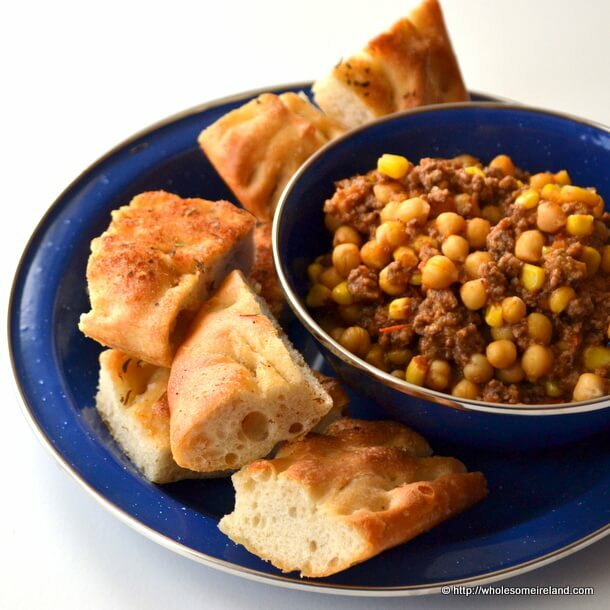 I love anything with chickpeas in it! Will be giving this a go! Great MD, glad to hear it! This sounds nice and easy, it’s lashing out and I have all the ingredients in the cupboard so going to try it for two small ones this lunchtime – thanks for making it so easy and clear! Ah great LeafyLou. I’m glad you find it easy to follow and I hope that you like it! Oh yum, can’t beat a dash of vinegar!